I've only done French macarons a couple of times so I figured it was time to try them again. 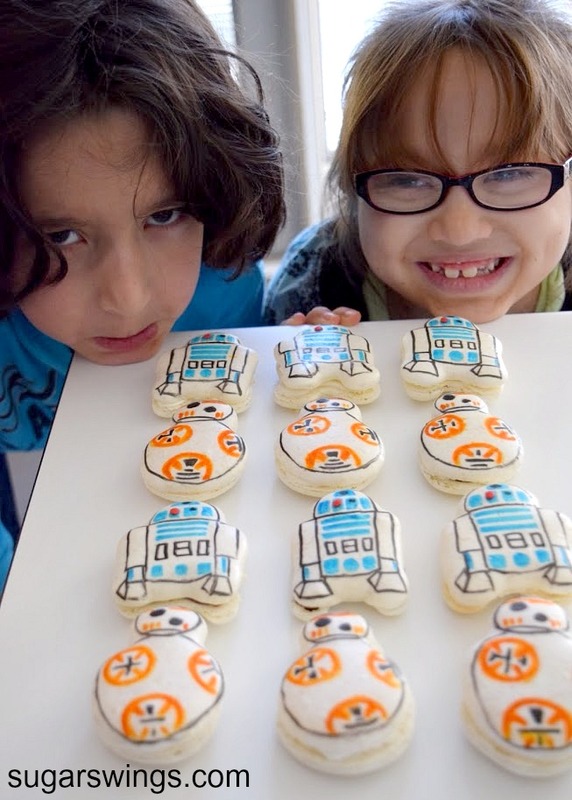 Once they are baked, you can draw on them with edible food writers. I thought they might be too delicate for that, but they hold up really well when you write on them. And they take the color really well too. 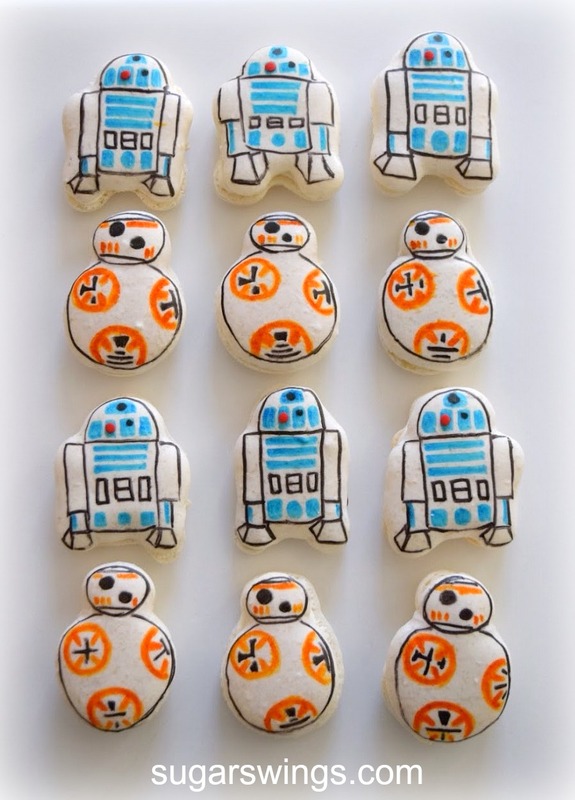 And if the macarons are relatively even you can even stand them up. 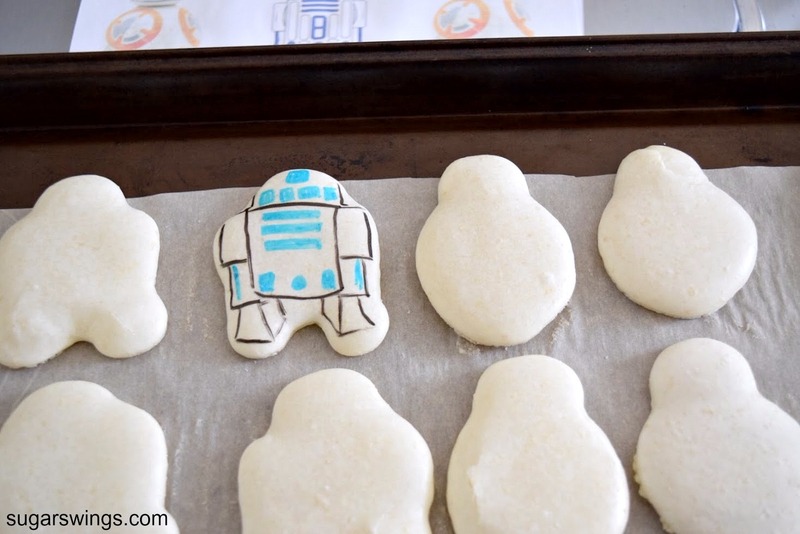 I think R2 definitely needed a new friend. Well at least I hope they are friends in The Force Awakens! 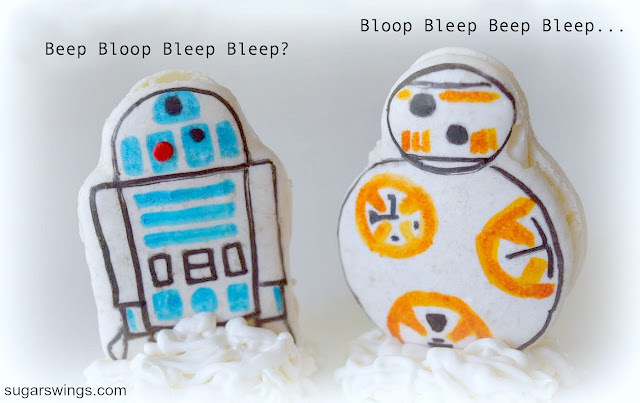 Who knows maybe they are droid rivals?! I think I'm sticking with friends. How cute are they together?? Only one of my kiddos can eat macarons since they are made with almond flour but they approved of them just the same. Well one was expressing his "dark side" in the pic! 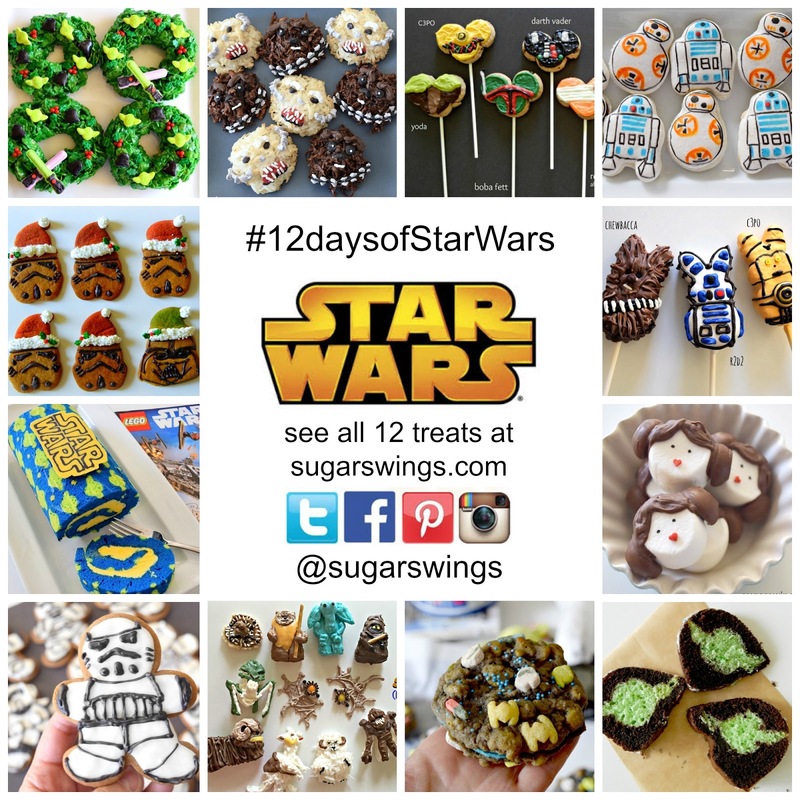 That wraps up the #12daysofStarWars for me. I hope you enjoyed all the treats, it was fun doing the new ones and fun to look back at some of my favs from over the years. Now to wait until Sunday when we see the movie. I'm hoping anyone that sees it tonite or opening day tomorrow doesn't ruin it for everyone seeing it later. Like where is Luke????? Can't wait to find out! Thanks for following along and for swinging by everyday to see more! I think I'm done with SW for quite awhile! 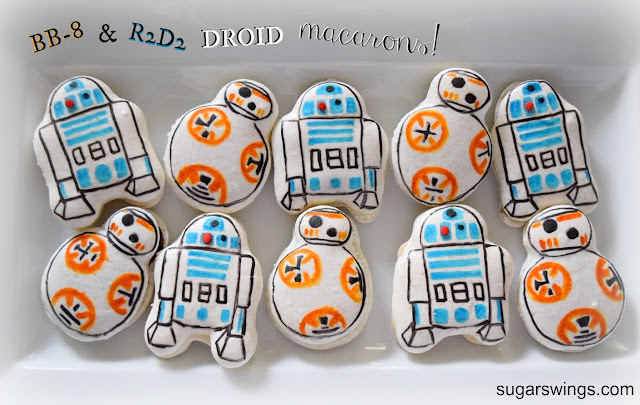 For step by step directions for making macarons. Please visit Annie's Eats post here. She does an excellent job in explaining how to do them well and relatively easily. The directions below are to make the droid shapes and detail. 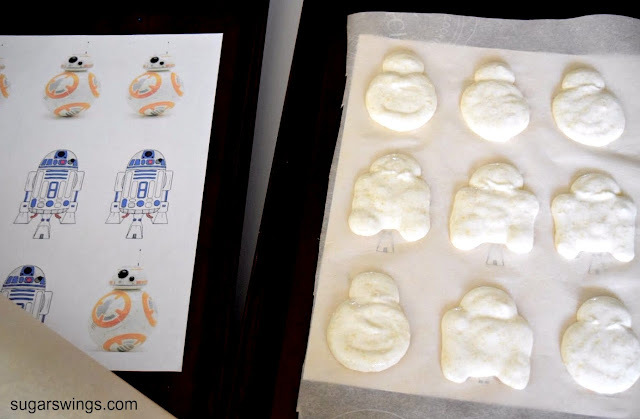 Once you have your macaron batter ready and in a piping bag, place printed images underneath parchment paper on a cookie sheet. Pipe the droid shape following the images. Bake at 325 degrees for 9-12 minutes. Check to ensure tops are done and macarons are not browning. Let rest on baking sheet for 5 minutes. Macarons should come easily off parchment. 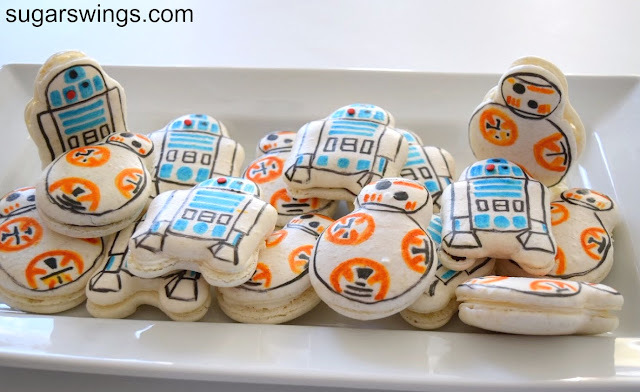 Once cooled, use edible food writers to add the droid details on half of the macarons. 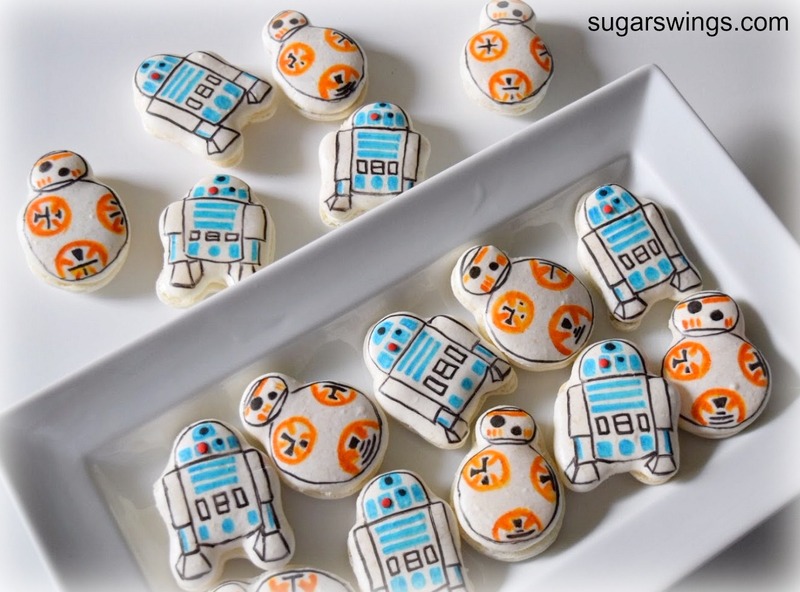 Add a later of buttercream to the plain macaron shells and cover with the other macaron with BB-8 and R2D2 detail. Wow, these are the most amazing Star Wars treats! You've outdone yourself with this Macarons. Enjoy the movie!